Many home & business owners now look for the additional reassurance of security grilles and gates. This helps to ensure their homes & offices are secure when empty or at night. At ARC Locksmiths we provide a fast, honest, reliable security service. We cater to the individual needs of the customer in both commercial and domestic properties. We have a number of attractive solutions for increased window and door security. We’ll can talk you through options and asses your needs. Quotes are free so give us a call 01438 815854 . With rising Vandalism and burglary, the need for physical security at home and work is growing. Security grilles and gates can add privacy and peace of mind. They are great visual deterrents helping to reduce crime rates on most properties. At ARC Locksmiths we sell and install Security shutters, retractable gates, and removable window bars. All designed to deter the threat of break ins and vandalism. 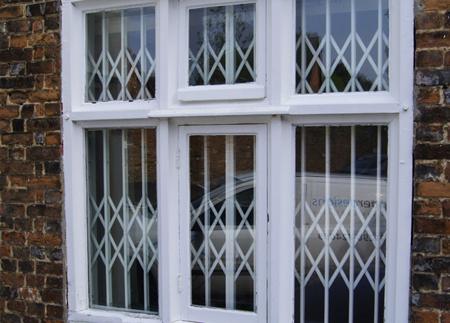 Our Grilles provide a high level of security whilst being discreet when needed. They can be hidden behind curtains when not in use, whilst providing the highest form of security when closed. All of our products are manufactured to the highest standard possible. We custom measure to suit all sizes and window/door designs. The result is an unobtrusive and aesthetically pleasing look. ARC Locksmiths created a sub-division specialising in security grilles and gates over 10 years ago. Based in Hertfordshire, we have been providing security services to all local areas since. We also cover Buckinghamshire, Bedfordshire and North and West London. With experience gained over many years we are a company you can rely on for honest, value for money, service. For a free, no obligation, quote contact us.